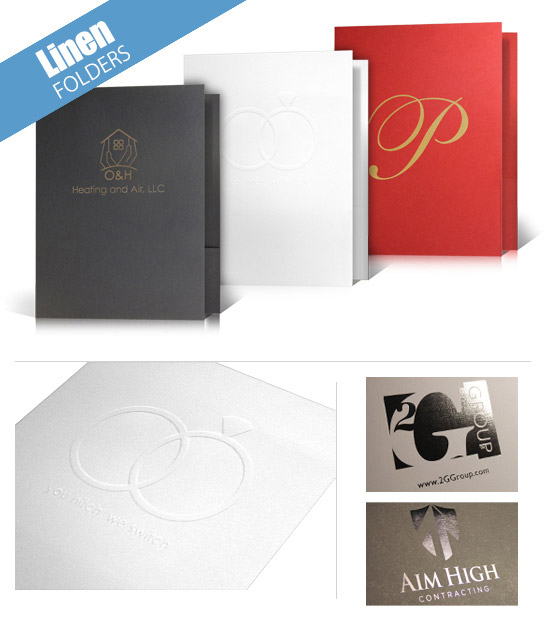 With our Linen Folders you can Foil and/or Emboss up to 25 Square Inches! We offer up to 25 Square Inches of Foil and/or Emboss at one low price. If you need to do a larger Foil and/or Emboss Image, please contact us for a custom quote at (866) 936-5337. At FolderPrinters.com, the Linen Folders are made using only Premium 100# Linen Cover in 5 different colors! The linen folder adds a nice and distinctive look to any project. Choose between Foiling, Embossing or Offset Printing, either way you are going to be impressed (and so will your clients).